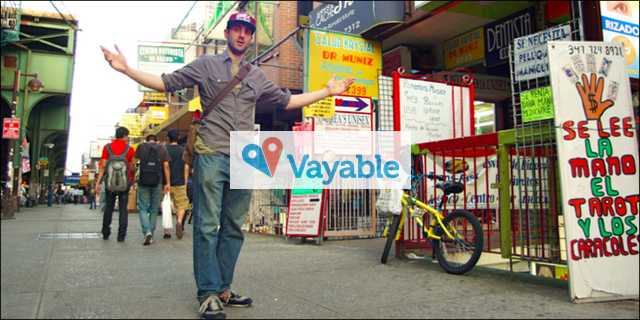 Vayable cofounder Jamie Wong used to help friends with their travel plans. It was a hobby; it was something she was simply very passionate about: sharing her own experiences and tips to others. She travel-planned honeymoons, family vacations, and romantic getaways for friends – then she blogged about it on WordPress. This began to spark the interest of an increasing number of friends, who also wanted to share (or discover) their own unique travel experiences. “I realized that there was a huge opportunity to make a platform,” Wong said. So, with natural entrepreneurial passion and marketing savvy, Wong pursued the opportunity. In 2010, she started her own company and founded Vayable, to which she dedicated herself full-time. She found a technical cofounder, designed the site, and began to develop the technology needed to build the community-based online marketplace. It’s one that enables travelers all over the world to book unique, insider travel experiences. From helping friends, Wong has moved on to helping the world. And she’s building, in her own way, the future of travel. Since its creation, Vayable has grown to offer over 2,500 hand-picked travel experiences in more than 600 cities, including San Francisco, New York, Paris, London, Chicago, Tokyo, Istanbul, Barcelona, and Buenos Aires. The site connects travelers with pre-screened local guides who offer tours and activities – or “experiences” – which can be anything from, say, a midnight street food crawl in New York or an insider-guided trip to a flea market in Paris, to a Whirling Dervish ceremony in Istanbul or an urban art tour through the streets of Berlin. “I want Vayable to become the way people travel,” Wong shared. Tech Cocktail caught up with Wong at the recent Big Kansas City, where she spoke more about her experience building Vayable. Here are the highlights of our exclusive interview. Tech Cocktail: Tell us more about how Vayable started. Jamie Wong: [Vayable] started off as a WordPress blog initially that was just kind of me offering experiences and [travel] tips. I was travel-planning honeymoons, family vacations, romantic getaways for friends. I did it as a favor because I would go on these trips and meet these amazing local people, and they wanted to be connected [to the locals]. So I started this blog and more friends were saying, “Well, I could participate. I know people I met at whatever trip I went on.” And that’s when I realized that there was a huge opportunity to make a platform here. Tech Cocktail: When you saw that opportunity, that idea, did you immediately execute on it? Wong: I knew what I wanted to do. When I moved back to San Francisco (where I grew up), I knew that I wanted to start this company and pull the trigger. But I felt for some reason like I wasn’t ready. I need to save more money, I need to gain more experience, I don’t know enough about this, I need to build my network, I should get more experience in the travel domain. There was every excuse possible running through my head – every reason under the sun. Thing is: all of those things were actually true and very rational, but I think that’s the whole point. When you start a company, it’s totally irrational. You can’t do what’s true. No one’s ever prepared, and (starting a company) is a complete exercise in putting a cart before the horse. Tech Cocktail: What’s your vision for Vayable? And what are you doing to realize that vision? Wong: I want Vayable to become the way people travel. I want to see us in every town, in every village, in every country around the world. Hopefully, this will provide the infrastructure for tourism. We’re building a platform where people are making a living doing what they love. I believe that this needs to start at home. So, all the values that we’re trying to impart to our community, it all starts with us. We’re building a team where everyone’s making a living doing what they love. Everyone on our team has had really incredible opportunities wherein they were paid more, gained more status, more everything. But they believe in our vision, in what we’re doing, and they want to be a part of seeing the direct effect of their work every day and seeing the impact it makes on people around the world. Tech Cocktail: What are some of the things you’ve learned while building Vayable? Wong: Gosh, there are countless things I’ve learned. I do know that focus has always served us, and when we cast a net too wide as far as what we want to accomplish, there’s less progress, and when we really focus, the more growth there is. Acquiring new customers, for example: we try not to build communities in 50 different cities (at the same time). We look at where we’re most popular, which is San Francisco and New York. Then we invest in those two communities, bringing more business to our guides there as well as getting more guides for our customers. Tech Cocktail: At Big Kansas City, you talked about jumping on a plane and building a parachute on the way down. Can you give an example of when you tried to do that? Wong: Starting a company, for sure, is an example of that. I mean, every day, you’re doing that. You don’t know, because no one’s done it before. You need to remind yourself that while it’s great to get advice from mentors and read books and educate yourself about your market, all you can really do is follow your instincts. There’s no playbook; you’re writing your own playbook. And anyway, if there was already a direct way down, then you’re probably not making a great contribution and you should probably pivot your idea. The art of the startup is building your parachute on the way down. Guest author Chris Campbell is a seasoned entrepreneur passionate about startups, traveling, and his current company Review Trackers.